We’d love your help. Let us know what’s wrong with this preview of Vertigo by G.S. Jennsen. Individuals from across the galaxy fight for their own surv Where do you run when there is no escape? Where do you turn when the enemy within is as dangerous as the enemy unknown? To ask other readers questions about Vertigo, please sign up. G.S. 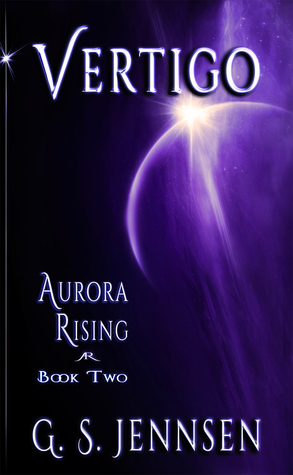 Jennsen Book Three of the Aurora Rising trilogy, Transcendence, will be out early next year (likely February or March). Keep an eye out here on my Goodreads…moreBook Three of the Aurora Rising trilogy, Transcendence, will be out early next year (likely February or March). Keep an eye out here on my Goodreads page to know when it's released, or sign up on my website (http://bit.ly/gsjennsen-newsletter) to get an email notification. Another fantastic book in this series! I started reading this book immediately after finishing Starshine, and unlike the first book, it took me no time at all to get caught up in the story. Vertigo picks up right where Starshine left off. Caleb and Alexis have gone through the portal seeking answers about the alien’s origins and hopefully some viable way to defeat them. In the meantime, the conspiracy which incited war between the Earth Alliance and the Senecan Federation is gradually being uncov Another fantastic book in this series! I started reading this book immediately after finishing Starshine, and unlike the first book, it took me no time at all to get caught up in the story. Vertigo picks up right where Starshine left off. Caleb and Alexis have gone through the portal seeking answers about the alien’s origins and hopefully some viable way to defeat them. In the meantime, the conspiracy which incited war between the Earth Alliance and the Senecan Federation is gradually being uncovered by intelligence agents from both governments. As they work to uncover the true reasons behind the second Crux war and hopefully put a stop to it, everyone’s focus continues to shift towards the approaching alien armada that seems content to obliterate all populated worlds in its path. I don’t want to give away any details of what happens in the story so if you want to know you’ll just have to read it; however, I will say this: it’s fantastically awesome and difficult to stop reading. The pace of the story has picked up and thing really don’t slow down at all throughout the course of the book. The only gutting thing is that the story ends abruptly when things were really exciting and you are left desperately waiting for the third book which isn’t published yet! 5 stars: Another outstanding read by Jennsen. Is this space opera at this point? Don’t know, don’t care. I love the world she’s created and the multi-layered characters and subplots. I wanted to strangle her last night when I finished this book and had no book three to dive into. She goes farther than I expected in book two and pulled it off beautifully. Looking forward to book three. 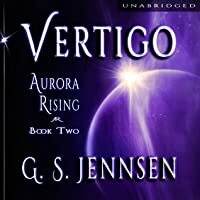 Vertigo, Aurora Rising #2 by G.S. Jennesen is a fantastic science fiction thriller with a tiny twist of romance. Great characters, cool science and an amazing heroine make this story work. I was so intrigued by the spaceship Siyane that I really hope it is even more of a feature in the later books. The second book was no let down. The additional backstory of our heroes was very welcome. Too often, 2nd books in trilogies suffer the "sophomore syndrome" in which they are little more than plot bridges connecting the world building introduction (1st book) and the climactic conclusion (3rd book). Because of this, many authors use it as a filler tool--expanding on the world they've created, the people/cultures populating it, and providing some additional tidbits on why we should care--rather than an integral plot driving mechanism. I was so very pleased to discover that Vertigo was n Too often, 2nd books in trilogies suffer the "sophomore syndrome" in which they are little more than plot bridges connecting the world building introduction (1st book) and the climactic conclusion (3rd book). Because of this, many authors use it as a filler tool--expanding on the world they've created, the people/cultures populating it, and providing some additional tidbits on why we should care--rather than an integral plot driving mechanism. I was so very pleased to discover that Vertigo was not relegated to such a fate. It continues the adventure from the get go, much in the way that gives you the impression you've merely turned the page and started a new chapter than a whole other book. I'm going to be totally honest here: After reading the first book in this series, I wasn't sure I was going to like the sequel. Starshine was a decent book, but I had some major misgivings with certain aspects of the writing and wasn't sure it was really my cup of tea. Despite that, the story and main characters were compelling enough that I wanted to keep reading, so I bought Vertigo. I'm so glad that I did, because within twenty pages, G.S. Jennsen converted this reluctant reader into a die-ha I'm going to be totally honest here: After reading the first book in this series, I wasn't sure I was going to like the sequel. Starshine was a decent book, but I had some major misgivings with certain aspects of the writing and wasn't sure it was really my cup of tea. Despite that, the story and main characters were compelling enough that I wanted to keep reading, so I bought Vertigo. I'm so glad that I did, because within twenty pages, G.S. Jennsen converted this reluctant reader into a die-hard fan. It has been a while since I read the first book of this series, but I remember that it was at least decent, maybe even pretty good. * Several times, characters are introduced over several pages only to be killed without ever having played any role at all. * The description of science is rather painful. It often feels as if the It has been a while since I read the first book of this series, but I remember that it was at least decent, maybe even pretty good. * The description of science is rather painful. It often feels as if the author randomly picked words from the index of a physics textbook and then arranged them into grammatical sentences. Now, I can perfectly accept a SF novel that doesn't explain any of the future technologies, but if (like in this case) the book attempts to be scientific, it should at least remotely make sense. If you have taken e.g. an introductory undergraduate physics course, be prepared for a lot of pain. Here's an example: one of the protagonists looks at her watch, sees that it runs "faster", and concludes that time in their region of space must be passing more quickly. * The extent of the main protagonists skills compared to anyone else is just not believable (think someone running into a military repair bay and showing the technicians how to fix a nuclear reactor, or grabbing an advanced alien device and integrating it into your ship in a few hours). * The development of the relationship between Alex and her mother is rather predictable. That said, I think that even if the above points were all fixed, the book would still not really excite me. Somehow the book just doesn't get me to care very much about what's happening. On the plus side, the story arc with Richard and his partner was very well written and quite believable. I thought I loved the first book, and then I read this one and I can't decide which I liked better. Becase . . . Caleb. Jennsen took me by surprise, yet again, and all the characters that I loved in Starshine showed up again with perfect consistency in this book. It's just a great escapist read and makes me want space exploration. The intricate plot is impressively even from the previous book as well. Much respect to the author. After a slow start in the first book (which was needed for the world building and set up of the story), I'm really getting into this series now. Very good writing - action, emotional at times, great characters. An excellent continuation of an amazing story. Soooo good to binge this series. The reread is as good as the first read. Maybe even better. Off the top of my head, I can only think of 4 or 5 franchises where sequels – second installments in particular – are actually better than their predecessors. When you’re the author of a series, you always hope that your sequel will turn out better than your first book. G.S. Jennsen has done it. While I still enjoyed Starshine immensely, I was one of “those” people who thought it started out a bit slow. It was all relevant background information that the reader needed to know in order to understan Off the top of my head, I can only think of 4 or 5 franchises where sequels – second installments in particular – are actually better than their predecessors. When you’re the author of a series, you always hope that your sequel will turn out better than your first book. While I still enjoyed Starshine immensely, I was one of “those” people who thought it started out a bit slow. It was all relevant background information that the reader needed to know in order to understand the plot and setting, but it made it a little hard for me to get sucked in at first. This was certainly not the case with Vertigo. With all of this information already set up, the story could get going right away. And that’s exactly what it did. If you just finished Starshine and are on the fence about continuing the series, READ VERTIGO! There were some aspects of Starshine that people struggled with. It was a bit slow at the start, there were too many characters to keep straight, and there was too much information being thrown at you. These are not things that I had a probem with, but I can understand why others did. If you are in this boat, I assure you that Vertigo lacks these problems! Vertigo benefits from Starshine having already e If you just finished Starshine and are on the fence about continuing the series, READ VERTIGO! Vertigo benefits from Starshine having already established the main characters and the main bulk of world building. Vertigo introduces some new characters and settings, but at a much more manageable pace. In addition, Vertigo is able to proceed at a much faster and more stable pace than its predecessor. The new storylines explored in Vertigo are amazing! The growth of Miriam as a character is fantastic, she quickly became a favorite. Kennedy, Richard, and Will also get more of a spotlight and they arefantastically written. It is also awesome to follow Olivia in her deadly exploits! You are never sure what she is going to do next, but you can be sure it will cost a few lives! The Alex/Caleb storyline also moves at a good pace alongside the rest of the characters. You really get to dive into the mystery and intrigue of the universe Jennsen has created (I just realized the irony of that statement, all things considered). We get to start to see what is on the other side of the curtain, and the alien thought process is as foriegn as one can expect! This book had the same issues that the first book in the series did, it's really boring and there is no suspense whatsoever. Let me give an example, towards the end of the book, our two romantic protagonists make a series of discoveries about their enemies, and then take a couple of actions that will have ramifications towards the war between the humans and the aliens. That part is interesting. This is followed by a chapter that describes a warroom style meeting between the higher ups about what This book had the same issues that the first book in the series did, it's really boring and there is no suspense whatsoever. Let me give an example, towards the end of the book, our two romantic protagonists make a series of discoveries about their enemies, and then take a couple of actions that will have ramifications towards the war between the humans and the aliens. That part is interesting. This is followed by a chapter that describes a warroom style meeting between the higher ups about what course they should take with the aliens, should they continue to fight, or should they let the aliens retreat while the humans follow their demands for doing so. There is an ENTIRE chapter of this conversation, all the while the reader is aware of the fact that the aliens no longer have any leverage to make demands. The warroom finds out about this with ten pages left in the book. So why did Jennsen make us read an entire chapter of moot debate, debate that the reader knows means nothing, and will be immediately forgotten by the characters? The whole novel is full of instances such as this, and it makes for a super boring read. I am glad the next installment of this series hasn't been released yet, so I can pry myself from this endless cycle of continuing reading just to find out what happens. Alice and her discoveries at the bottom of that rabbit hole are utterly eclipsed by everything Alex and Caleb discover after transiting that mysterious portal in the Meltis nebula. Deep in another universe (or have they moved into another dimension?) lies a shrouded duplicate of Earth which, except for several fire-breathing red dragons and a couple of ethereal immortals, appears completely uninhabited. The role of those dragons is a tribute to Ms Jennsen’s skill as a writer whilst the immortals Alice and her discoveries at the bottom of that rabbit hole are utterly eclipsed by everything Alex and Caleb discover after transiting that mysterious portal in the Meltis nebula. Deep in another universe (or have they moved into another dimension?) lies a shrouded duplicate of Earth which, except for several fire-breathing red dragons and a couple of ethereal immortals, appears completely uninhabited. The role of those dragons is a tribute to Ms Jennsen’s skill as a writer whilst the immortals clearly have differing views about the future of humanity and the Artificial Intelligence controlling the alien battle fleets invading ‘our’ galaxy. Despite the ensuing violence it takes a predictable amount of time before the underlying reason for the war between the Earth Alliance and the Senecan Federation is recognised for what it is – and ended. Something tells me the belated development of galactic Artificial Intelligence capabilities (plus a suspected schism between those ethereal immortals) will be a critical factor in ‘Transcendence’, the final part of this skilfully written trilogy. This is an exciting and fun book, and I highly recommend this series. Vertigo has a much more traditional science-fiction feel than the first, though the mystery and romance are still present. Set in a wartime environment, the author creates a believable feeling of dread as the characters are put in increasing peril. I really love the characters that Jennsen creatures; I care about them, so much in one part I was mentally shouting at the book. (Maybe even out loud; you’d have to ask my cats.) The This is an exciting and fun book, and I highly recommend this series. Vertigo has a much more traditional science-fiction feel than the first, though the mystery and romance are still present. Set in a wartime environment, the author creates a believable feeling of dread as the characters are put in increasing peril. I really love the characters that Jennsen creatures; I care about them, so much in one part I was mentally shouting at the book. (Maybe even out loud; you’d have to ask my cats.) The book slows down in the middle for a delightfully sci-fi exploration of the human experience, and then picks back up at the end for a page-turning finish. So page-turning I refused to go to bed until I had at least read a few chapters of the next book in the series. The heroine, however reluctant, continues to make leaps of intuition and logic in her efforts to save humanity and begins to understand her mother, which in my opinion is a prodigious feat in itself. Growing up with mine then living and caring for her as an adult, I learned that understanding wasn't necessary. Her experiences shaped her as min did me. We weren't the same and never would be. Alex received that gift while her mother was alive and that to me was one of the more inspiring emotions that kept me reading. Humanity coming together at last, after another pointless war came a close second. I'm hoping that it doesn't take us as long and we leave war in our past and don't carry it with us to the stars. But a novel has to have conflict and this one was more inspiring than just the BEM's are aggressive and conflict the only solution. The author hints at the mother conflict, in that our understanding is incomplete especially as it regards a different species. I'll admit Vertigo didn't get to me as fast as Starshine did; it took a while to go back into this universe. But when I did, it instantly reminded me of why I fell in love with the series in the first place. It amazes me how so many characters can be so extremely well developed. They all feel real. They're all interesting. And most impressively, despite how many there are, it always feels like we spent enough time with each one to understand them. Yet it still feels like we didn't get enough and I'll admit Vertigo didn't get to me as fast as Starshine did; it took a while to go back into this universe. But when I did, it instantly reminded me of why I fell in love with the series in the first place. It amazes me how so many characters can be so extremely well developed. They all feel real. They're all interesting. And most impressively, despite how many there are, it always feels like we spent enough time with each one to understand them. Yet it still feels like we didn't get enough and can't wait to know more. The plot is still intriguing and the way everything connects sooner or later is really rewarding. The world-building, which was one of the most impressive things from the first book, does not slow down. On a side note (but a very important one), I'll say this series contains one of the most interesting, diverse, entertaining and intriguing cast of female characters I've ever read. And none of them is a stereotype. This book was awesome! I got mad every time I had to put it down. OK...what I loved-Alex and Caleb's ingenuity, passion and daring. I dare say that without them humanity would be up a creek. I loved Richard and Will's story, loved how things progressed when certain truths came out. Loved the writing, dialogue, description and again, Jennsen's grasp of quantum computing, physics and the potential for mankind, future AI and the realities of the human condition. What I liked-Kennedy finally gets a better role to play, as it where. We get to see a woman who, while wealthy and entitled, can survive insurmountable odds and not fall apart like so many female characters are written to do. What I didn't like-not sure...I'll have to get back to you on that one. The story was great, though I feel like the action slowed down a bit in the middle. It's okay though, because things really kicked into gear during the last 20% of the book. I'm excited to see what will happen. That O'Connell guy really ticks me off! I can't wait to read the next installment. Didn't disappoint, intriguing plot, really likable and believable characters all held together by some extraordinary srorytelling. Much better than the first book, mostly because the events are more focused now and when it hopped to other characters it progressed the main conflict more clearly. Another fantastic book in the Aurora Rising trilogy. This book was as good if not better than the first, showcasing mankind makeing hard choices in the face of a annihilation. Really enjoyable. I thought that I couldn't be surprised after the first book, but I was. Loved it. A good fun soft-sf romp. A good sequel to the previous book, continuing the story of the Aurora Rising trilogy. Book 2 was just as good as book 1. Kicking myself for not reading these sooner, and I can't wait to get to book 3. A good story. Fast and full of twists and turns. “She burst into her hotel room pulling her blouse over her head with one hand while she yanked her shoes off with the other.